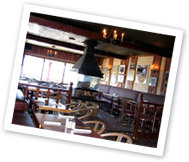 Specializing in good, honest, home-style food, the Airport Chalet's restaurant is the perfect companion to a great hotel. From the early risers to late diners, the restaurants hours can accomodate your schedule, and the great food, fresh daily baking, and reasonable prices will keep you coming back. Breakfast service starts at 6 am and includes all your favorites from 3 egg omelets to New York Steak and eggs. Lunch favorites like a Clubhouse sandwich made with real turkey and bacon or a Beef Dip with tender slices of fresh roasted beef. For dinner consider the traditional Liver & Onions or our extra crispy, extra tender Chicken Dinner. Relax by the fireplace in the cocktail lounge, enjoying one of our hot specialty drinks. For the sports enthusiasts, the game looks great on our large-screen TV. Airplane buffs will appreciate our pictorial airport history displayed on the lobby and lounge walls.